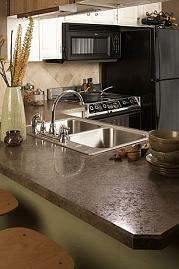 Painting your laminate countertop can easily provide you with a quick fix for your tired looking kitchen space. This is an option you should definitely consider when planning to remodel your kitchen as painting the laminate countertop is going to be less expensive when compared to having to replace the whole surface. Also, painting can be regarded as a perfect way to extend the lifespan of your laminate work surface, a least until you will afford to have it replaced. However, if you decide to paint your laminate countertop, you must take extra care when it comes to the finished surface. For instance, you should not use your painted laminate countertop as a chopping board because this surface is more prone to chipping and scratching when compared to a brand new laminate countertop. Also, you may increase the durability of your painted laminate countertop by applying a protective and quality top coat. When planning to paint your laminate countertop, you will have to take your time and follow several steps in order to achieve the wanted results. First, you will have to clean your laminate countertop  you can do this by using trisodium phosphate. Next, you will have to come up with a follow up, namely you will have to use an alcohol wash in order to remove all the possible traces of oil. Keep in mind that your laminate surface must be sanded by hand  an automatic sander is likely to be too vigorous and the hardboard right underneath your laminate countertop may be marked by its action. Next, you will have to wash the laminate countertop with a quality alcohol wash and apply the necessary primer. Once this primer is completely dry, you will have to apply at least 3 coats of melamine paint  apply the paint by using a roller and wait until each coat is completely dry before starting to apply the next coat of paint. Soon after all the coats dry, you can continue by adding the necessary topcoat that will guarantee an extra shine for your laminate countertop. If mistakes occur when trying to paint your laminate countertop, you will have to sand the surface down and start all over again. Your finished painted laminate countertop will look great but you have to make sure that you handle it with great care as it can chip really easily. Also, you can go for a granite effect for your painted laminate countertop  just use a couple of different colors and apply each of them by using a sponge, soon after you have applied the final layer of your preferred base color.